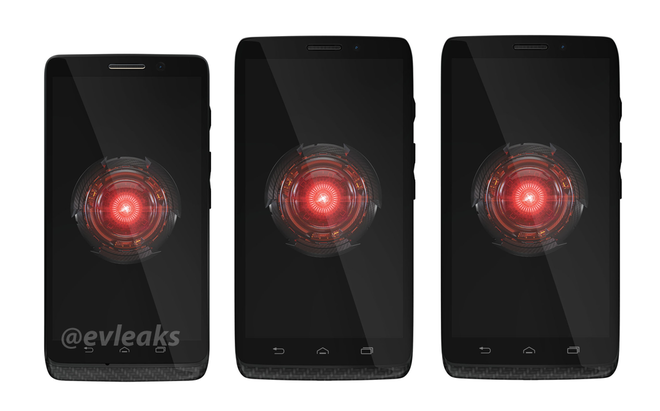 We have less than half a day left before the big Verizon triple-threat reveal of the new 2013 DROID family in New York City and San Francisco. 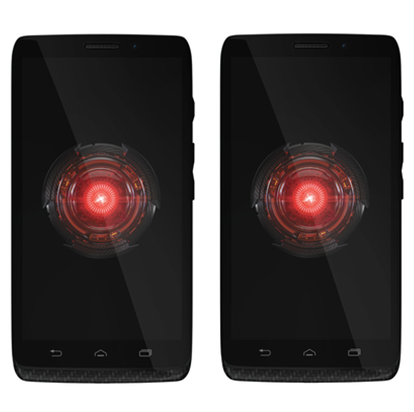 The DROID Mini, DROID Ultra, and DROID MAXX should be worthy follow-ups to last year's DROID RAZR M, DROID RAZR HD, and DROID RAZR MAXX HD. In this post, I'm not going to talk about processor specs, RAM, or internal storage. Instead, I wanted to provide reliable information about these phones' batteries, along with the confirmations of wireless charging support built right into them. As a bonus, NFC and Wi-Fi details are also presented. DROID Mini XT1030 - 2,000mAh (battery model SNN5916B). DROID Ultra XT1080 - 2,130mAh (battery model SNN5924A). DROID MAXX XT1080M - 3,500mAh (battery model SNN5925A). DROID RAZR M - 2,000mAh, which matches the Mini quite well. DROID RAZR HD - 2,530mAh, which quite significantly tops the Ultra by 400mAh. DROID RAZR MAXX HD - 3,300mAh, which is actually 200mAh short compared to the new MAXX. 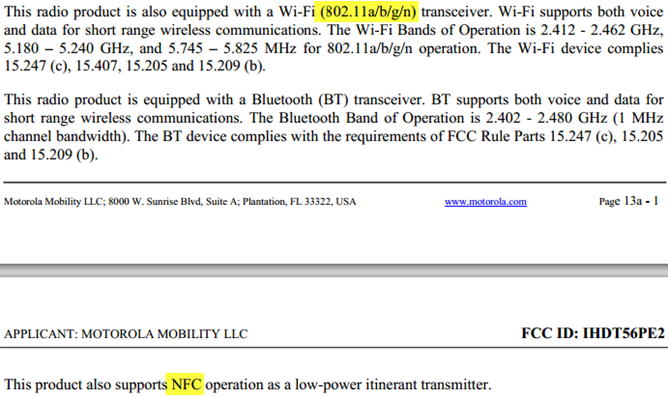 Outside of the battery specs, the FCC docs confirm NFC on all three, lack of 802.11ac (802.11a/b/g/n on all three, unlike the Moto X), and an inductive charging accessory integrated right into the batteries. The Mini and MAXX are listed explicitly, whereas the Ultra's battery may or may not support wireless charging. I'm inclined to think that if the other two do, it should as well. Excerpts from the FCC docs can be found below. system with a fully charged battery. 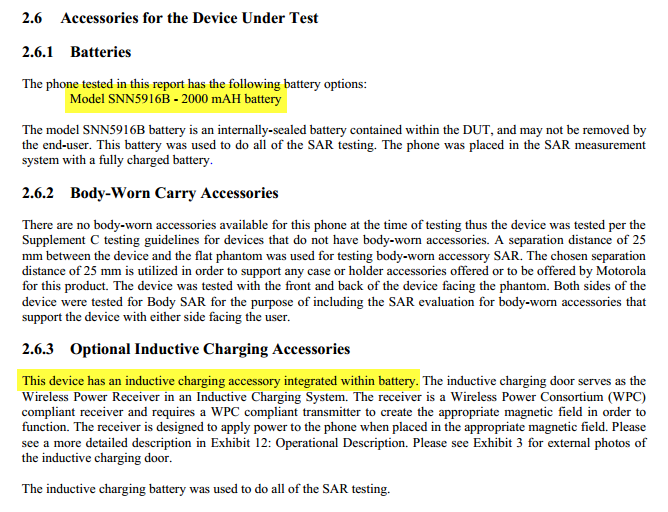 The inductive charging battery was used to do all of the SAR testing. 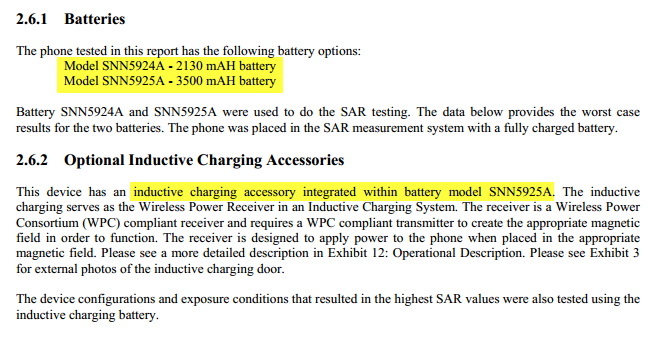 Battery SNN5924A and SNN5925A were used to do the SAR testing. The data below provides the worst case results for the two batteries. The phone was placed in the SAR measurement system with a fully charged battery. This device has an inductive charging accessory integrated within battery model SNN5925A. The inductive charging serves as the Wireless Power Receiver in an Inductive Charging System. The receiver is a Wireless Power Consortium (WPC) compliant receiver and requires a WPC compliant transmitter to create the appropriate magnetic field in order to function. The receiver is designed to apply power to the phone when placed in the appropriate magnetic field. Please see a more detailed description in Exhibit 12: Operational Description. Please see Exhibit 3 for external photos of the inductive charging door. The device configurations and exposure conditions that resulted in the highest SAR values were also tested using the inductive charging battery. What The Hell Is Cyngn.com, And Why Is It Counting Down To August 19th, 2013?